A rare opportunity awaits at this remarkable hilltop home situated on 98.09 acres with extraordinary 360- degree panoramic views. 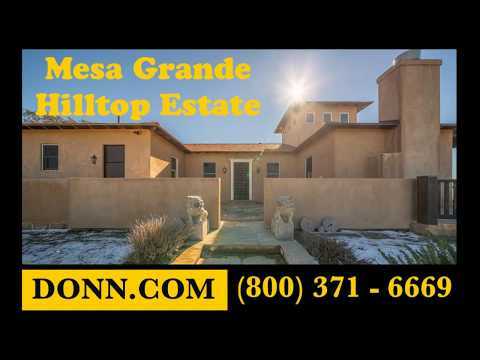 Located atop Mesa Grande, this locale beckons those in search of beauty, privacy and serenity. Gated access welcomes you through and along a gently meandering road leading to this most impressive and exclusive destination. The inviting, Spanish inspired, single-story 1997 home with 2 bedrooms and 2 full baths is rich with unique custom design elements inspired by world travels. Rich wood accents, plentiful windows and an expansive terrace create a seamless living experience between the home and its natural setting. Breathtaking views encompass the surrounding mountains and valleys and extend to the coastline beyond. A terrace circles three sides of the house and provides excellent spaces for entertaining and enjoying stunning sunsets. The terrace connects to the sizable detached garage with workshop, bonus room and half bath. Whether a weekend retreat or full-time residence, this off-the grid property offers privacy, tranquility and utility. Contact us to schedule your private showing. Topographically, the property is varied. Flat areas lead to gradually declining slopes. Mesa Grande is situated at approximately 3200 feet above sea level and enjoys four seasonal transitions throughout the year. Wildlife is abundant in the area: deer and turkey roam freely, while raptors and other rare species of animals can be found here because of the abundance of water and cover. Agriculture is still the dominant economic activity in the Santa Ysabel area. Horse and cattle ranches are the backdrop for the landscape of light residential development. There are many fine restaurants and lodging accommodations in the surrounding area of this centrally, yet privately located property. There are many recreational activities available in the area: the California Riding and Hiking Trail and the Pacific Crest Trail for riding, golfing at nearby resort, hunting and fishing, dining, and a variety of other opportunities for each family member. The Santa Ysabel Open Space Preserve offers excellent riding trails connecting the Santa Ysabel to other local communities. The famous Hale Observatory is less than 40 minutes away.